In support of the global requirements to dispose of electrical waste within environmentally acceptable specifications, WireFlow offers customers the take-back and recycle process to properly dispose of surplus and end-of-life products. Equipment that is returned to WireFlow through this program is disposed of in an environmentally safe manner using processes that comply with the WEEE (EU Directive on Waste Electrical and Electronic Equipment) regulations. All WireFlow-branded products are accepted under the program. The WEEE Directive places an obligation on manufacturers to take back electronics products at the end of their useful lives. A sister directive, ROHS (Restriction of Hazardous Substances), complements the WEEE Directive by banning the presence of specific hazardous substances in the products at the design phase. The WEEE Directive covers all WireFlow products already sold to businesses, as well as products that will be sold in the future. 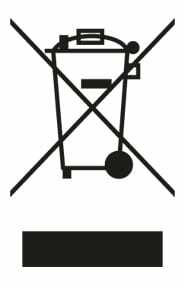 The WEEE symbol (as it appears above) on the product or its packaging indicates that this product must not be disposed of into your local municipal waste. Instead, it is your responsibility to dispose of this waste equipment by handing it over to the manufacturer or a designated collection point for the recycling of waste electrical and electronic equipment. If you have a WireFlow product that needs to be disposed of or recycled, please contact our support team at support@wireflow.se for instructions.